Right now, Foo Fighters consists of Chris Shiflett (guitar), Dave Grohl (vocals/guitars), Nate Mendell (bass) and Taylor Hawkins (drums), but in the beginning there was only one - Dave Grohl. Shortly after the death of Kurt Cobain and the break up of Nirvana, Grohl and friend and record producer Barrett Jones booked a studio and recorded the 15 tracks of what was intended to be a demo tape but was destined to become the Foo Fighters first album. Amazingly, Grohl played all the instruments on the album with the exception of a single guitar track contributed by Greg Dulli (Afghan Whig/Twilight). The self-titled first album was released in the summer of '95 and went platinum by early '96. Deciding to make Foo Fighters an actual band, Grohl recruited bassist Nate Mendel and drummer William Goldsmith, both former members of Sunny Day Real Estate whose leader had turned to Christianity and in effect had put an end to the group. Also joining the group was former Germs and Nirvana guitarist Pat Smear. This line-up was short lived as Goldsmith left the group in the midst of recording the Foo Fighters' second album, The Colour And The Shape. Consequently, Grohl wound up playing drums on more than half the tracks. 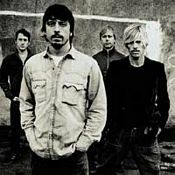 The album was released in May '97 and there followed a procession of hit singles including "My Hero," "Monkey Wrench", "Everlong" and "Walking After You". Taylor Hawkins would replace Goldsmith on drums, only to have Pete Smear leave the group shortly afterward. Grohl, Mendel and Hawkins put their heads together and recorded 1999's There Is Nothing Left To Lose. "Learn To Fly" was an immediate hit. With another global promotional tour in the offing, the band recruited guitarist Chris Shiflett. They would go on to win two Grammies: Best Rock Album and, for "Learn To Fly," Best Short Form Music Video. For a while, it seemed that the group's fourth album, One by One, would never get off the ground. Working on side projects with David Bowie and Tenacious D, his own metal project - Probot, while at the same time collaborating with Queens of the Stone Age, the harried Grohl, in April 2002, cancelled his studio sessions with the Foo Fighters, costing the band three months of work and over half-a-million dollars. Eventually, with batteries recharged, the band got back to work. They finished One By One and it was released to rave reviews. There followed another world tour, the bands biggest to date. By 2004, One By One had become the fourth Foo Fighters record to go platinum and had earned the group two more Grammies: Best Hard Rock Performance for the "All My Life" single and a second consecutive Best Rock Album Grammy. The Foos earned additional accolades for their show-stopping Grammy performance of "Times Like These" in which they were joined by legendary jazz pianist Chick Corea. In 2005, having again taken a break from their individual side projects, the Foo Fighters prepared In Your Honor, their most ambitious opus to date, a double album with one disc representing the aggressive hard rock they're known for and the other a lush, melodic, acoustic set. "By splitting the difference," says Grohl, "you eliminate the middle ground. We can make the acoustic record far more delicate and beautiful and atmospheric than anything we've ever done and we can make the rock record far more brutal and aggressive and powerful than anything from our past." In Your Honor earned the group five 2006 Grammy nominations: Best Rock Song ('Best Of You'); Best Rock Album; Best Pop Collaboration with Vocals ('Virginia Moon' with Norah Jones); Best Rock Performance by a Duo or Group with Vocal ('Best Of You'); Best Surround Sound Album. Echoes, Silence, Patience & Grace, the sixth studio album by the Foo Fighters, was released on September 25, 2007. It achieved the number 1 position on the UK album chart in its first week, achieved the number one spot on iTunes through pre-orders alone, and went platinum in just 5 days after its release in Australia. It also went platinum in New Zealand after a week and, in the U.S., it entered the Billboard 200 album chart at #3, selling 168,668 copies in its first week and giving Foo Fighters their third straight Top 3 studio album in the U.S.